With super attractions, beautiful beaches and high quality restaurants, Scarborough is as popular as ever with both UK and international holiday makers. Britannia are proud to have three Hotels in Scarborough. 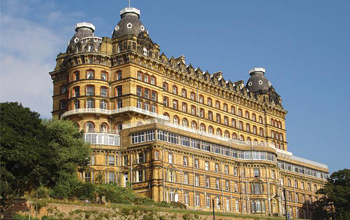 The Clifton, The Grand and The Royal Hotels are all famous local buildings that are instantly recognisable. The Clifton Hotel Scarborough, with its stunning sea views and fantastic location, is popular among locals and visitors alike. It has seventy en-suite bedrooms, free Wi-Fi and guest car parking not to mention the Castle restaurant which serves delicious hot food and hearty cooked breakfasts. For those preferring to stay in a hotel overlooking the harbour and South Bay, The Grand Hotel Scarbrough is worth considering. With over 400 rooms, cocktail bars, a premier restaurant and live entertainment, this hotel continues to be one of the best places to stay in Scarborough. The Royal Hotel Scarborough, with its impressive architecture, is another hotel located in the town centre, and it is perfect for weekend breaks, longer holidays and short stays. Guests looking to book a holiday in Scarborough should take advantage of the Britannia Price Guarantee, our promise to offer guests the best rates on our Scarborough Hotels, direct on our official website.